Back in my day, discovering new music and bands meant listening to the radio or going to Tower Records to sample albums at the listening stations. Now there are all sorts of apps and services to help you do that, right from the convenience of your smartphone, including a new app from Twitter. For those of you who aren’t familiar with Twitter, it’s a social networking service that lets you broadcast messages, called tweets, about what you’re doing or thinking, in 140 characters or less. People can follow you to receive your updates, and conversely, you can follow people you find interesting. 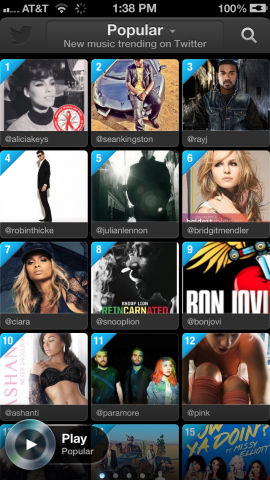 The new app, called Twitter Music, helps you discover new music and artists based on what people are talking about on the service — both within your network and the broader Twitter audience. 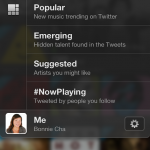 The free app is currently only available for iOS devices, though Twitter plans to bring the service to Android. 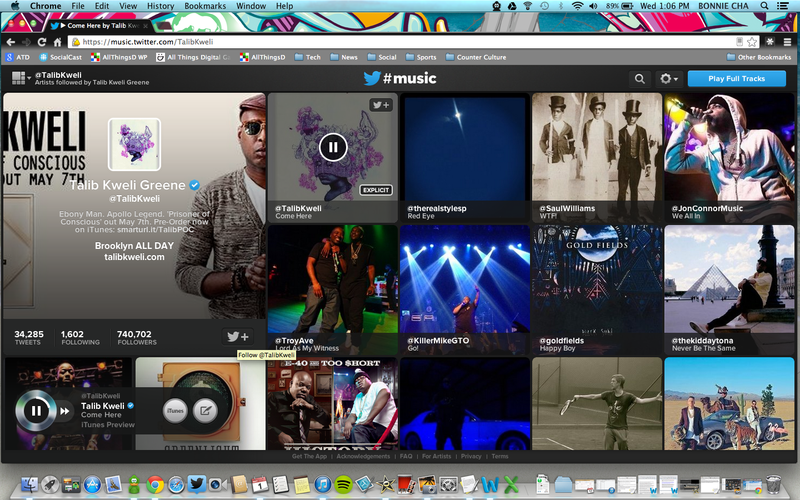 Twitter Music also works on any Web browser. I’ve been testing Twitter Music on my iPhone 5 for the past week, and it’s a beautifully designed app. It helped me keep abreast of what’s popular, and turned me on to a couple of new artists. The Web version also worked well, and it was nice to be able to navigate through the various sections on a bigger screen. 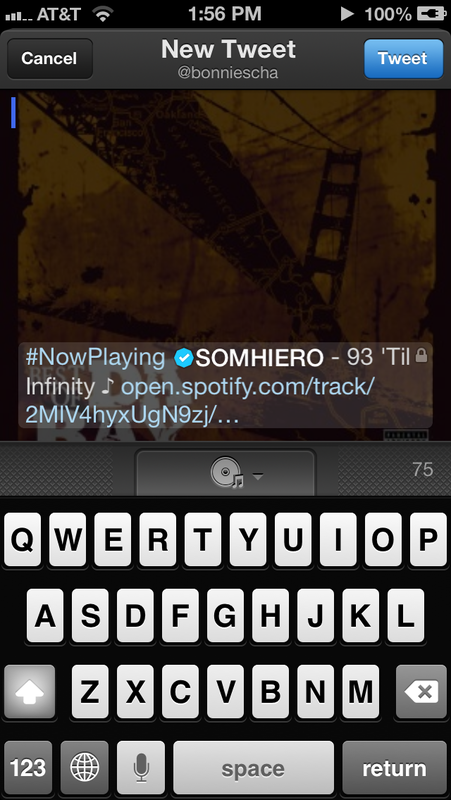 That said, Twitter Music as a whole has limited capabilities. For example, you can’t create a playlist or listen to multiple songs by one artist in sequence, so it’s not a replacement for other music streaming services like Pandora and Spotify — nor is it meant to be. Rather, it’s more of a complementary service than an adversary. The app’s value is largely dependent on how active you are on Twitter. While you’re not required to have a Twitter account to use the app, you’ll get more from it if you do, since it offers personalized recommendations based on the people you follow. Still, it puts the onus on the user to follow musicians and share what they’re listening to, which might not be appealing to everybody. 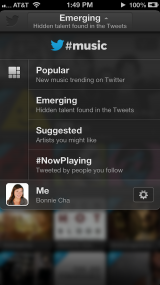 Twitter Music is divided into four sections: Popular, Emerging, Suggested and #NowPlaying. 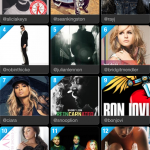 Popular shows you the 140 most popular new songs on Twitter, while Emerging surfaces 140 up-and-coming artists found in tweets. Both of these lists are constantly changing, depending on what’s trending at the moment on Twitter. The other two sections are designed to be personal to you. The Suggested section offers recommendations based on the musicians you follow on Twitter, and NowPlaying shows what your followers are listening to. There’s also a search function, but you can only look up artists, not particular songs. Navigating among the sections is easy. You can either use the drop-down list at the top of the page, or you can swipe left or right. Each page is presented with an attractive grid view that displays the album covers for all the artists on that list. 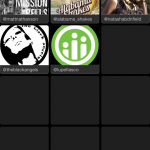 Tapping on an individual square will bring up a slightly larger image, where you can start following the artist on Twitter with a tap of a button, visit the artist’s Twitter profile page to see which musicians they follow, and listen to a 30-second preview of their song. The preview is powered by iTunes, and you don’t have to leave the app to hear the clip, which is nice. If you’re sold after 30 seconds, there’s a button to purchase the full track from iTunes. You can listen to an entire song if you are a Spotify Premium or Rdio Unlimited subscriber, though both of these services cost $10 a month. I’m a Spotify Premium member, and after entering my login details in the Settings menu, I was able to listen to full tracks with no problem. 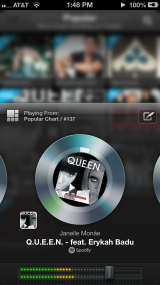 While a song is playing, you can tap the spinning record icon on the bottom left of the app, which brings up a music player interface. 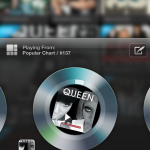 Here you can fast-forward and rewind a song by moving the record in clockwise or counterclockwise, adjust the volume and tweet what you’re listening to. With the latter, a preset message is written for you, such as “#NowPlaying @Alabama_Shakes – Hold On,” with a link to the track, but you can add a custom message, as well. Overall, I found the app to be well designed and easy to use, but I had mixed feelings about its usefulness. The Popular section wasn’t filled with many surprises. It’s populated with a lot of today’s pop hits from artists like Justin Timberlake, Rihanna and Bruno Mars. It would be nice if there was a way to filter songs by genre. The Emerging page was a lot more interesting to me. It introduced me to a ton of new artists that I’ve never heard of, and there were a handful of bands who piqued my interest, such as Guards and Houses. The problem is once I heard a song, I wanted to hear more from that particular artist, but there’s no way to do that from Twitter Music. Instead, you just have to take note of that artist and check them out on another service like Spotify. The Suggested section is supposed to offer you personalized recommendations, but in order for this to work, you have to already follow artists on Twitter. 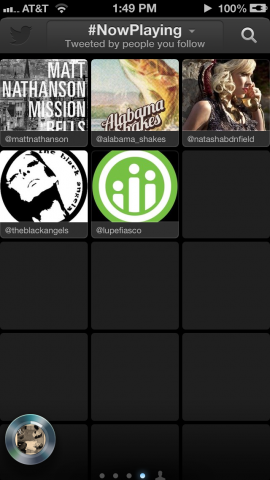 Prior to testing the app, I didn’t follow a ton of musicians, so my Suggested page was nearly empty. I only follow people if they have interesting things to say, so if there’s an artist who rarely tweets or only sends messages to promote concerts or new albums, I’m not going to follow them, even if I enjoy their music. Bottom line: I don’t want to be forced to follow people just to get music recommendations. I prefer something like Pandora, where I can create an artist-themed radio station and listen to a stream of their songs and musicians who are like them. NowPlaying wasn’t particularly useful to me. If one of your followers has tweeted what they’re listening to, then it shows up in this section. I follow more than 300 people on Twitter, but only four people actually broadcasted what they were jamming to, so this section of the app was also barren. This could change as Twitter Music grows and more people use it. 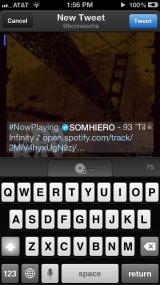 For those who are heavily engaged in Twitter, the app offers a bare-bones way to discover new music. But for everyone else, there’s no compelling reason to use it over existing music services.